This new release of KLog comes with some new features. There is no “Killer” feature but it adds some new things… and some of them are not known for me in any other logging software today. KLog now support realtime upload/edition/removal of QSO with ClubLog. KLog cluster client warns you if the spot you are seeing is a needed one for the DXMarathon edition of this year, so you can easily increase your DX-Marathon score! The autocomplete option is now working so if you have previously worked a station, KLog will suggest you some data coming from previous QSO. – Bugfix: An ADIF file with one blank line and one QSO used to froze KLog. – Bugfix: Minor bugfix in the definition of propagation modes. – BugFix: When editing a QSO the name was not shown. – BugFix: STX_String field was not always imported properly. – BugFix: Fixed a minor bug in log table regarding the prop_mode foreign key. – BugFix: Improved the color & status shown of a QSO on the DXCC. – BugFix: DXCluster: Fixed a bug that caused the colors to appear always as new one. – BugFix: DXCluster: The option to show only not confirmed was not working correcty. – BugFix: IOTA reference was not saved when entering a QSO. – BugFix: BIGCTY.DAT was not properly download in KLog first start. – GUI: Added some shortcuts in the preference widget. – GUI: Added a Propagation Mode Combobox. – GUI: Prop_Mode combobox automatically goes to SAT if sat name or sat mode are defined. – GUI: Added a Find DX-QSL requested option. – Added the 630M & 13CM bands. – Updated Mode & submode definition up to ADIF 3.0.4. – Special CQ & ITU zones in some calls are now identified. – KLog is able to import QSOs with no BAND field if FREQ field is present. – KLog offers the user a default value if RST_TX or RST_RX field is not present when importing. – Support of realtime upload, modification & removal of a single QSO to/from ClubLog.org. – Updated the DB with the PROP_MODE options. 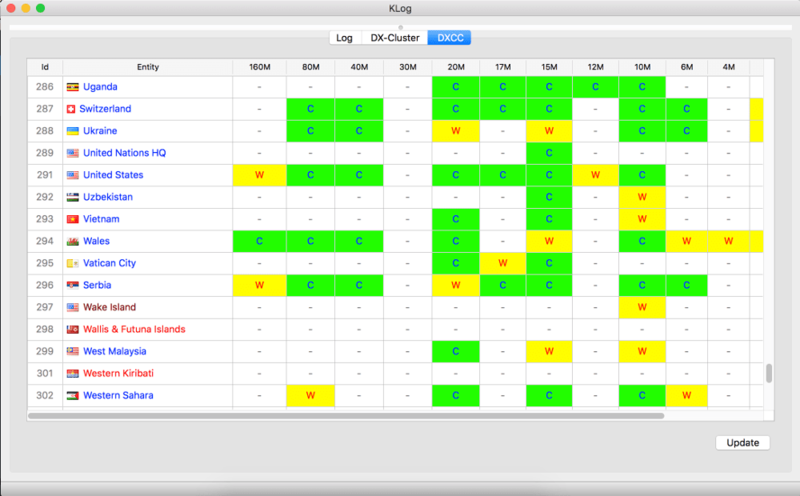 – Improved the way KLog manages & shows the bands & modes. – Removed the option to choose to run in memory or file in the start wizard. KLog will run always using a file for the DB. – Added an auto complete option to auto-complete info (QTH, Locator, Name, QSL Manager & IOTA) from previously worked QSO. – Cleared the world.cpp file. – Some minor performance improvements. Today, KLog is translated into Spanish & English. If you can help me translating into another language or coding KLog please contact me I will welcome you in the KLog team! As other times… Murphy arrives and just after the release I have found a small bug. So, as I had my computer still on, I fixed it and released again. The bug was only afecting satellite QSO and it is now fixed. Managing several logs is the main new feature of this release of KLog. I have also made the ADIF compatible with LOTW when including satellite QSO and a minor improvement on DX-Marathon support. – Bugfix: Fixed DataBase::getBandIdFromFreq it was not ansswering properly. – Now checks if band & frequency are coherent before adding a QSO. Band wins. – All Satellite QSO include the PROP_MODE ADIF tag to make it compatible with LOTW. – Improved the DXMarathon code. – GUI: Added basic Satellite support. – GUI: It is possible to mark a QSL sent via bureau/direct & DX QSL as requested with one action from Search box. – GUI: KLog request a valid QRZ and at least one first logtype to start using it. – KLog supports the management of several logs, being possible to edit, remove and select the one to use. Today, KLog is translated into Spanish & English. If you can help me translating into another language, please contact me.